TGIF!!! Thank Goodness It's Friday! and Thank Goodness It's Fun!! I have to say that I have yet to make a graduation theme card! When someone graduates I generally have made a generic "congratulations" card. I had fun taking this challenge! I went with the school/ office theme here. My fave element has to be the lined paper on the front. I had started the layout by using an actual sheet of lined paper but it was too translucent and thin. You all know that Stampin' Up! has the best quality card stock and that paper just did not fit. I decided to use a sheet of Whisper White Card Stock and a ruler along with Stampin' Write markers in Soft Sky and Calypso Coral to create the look. Punch along the side with the Spiral Boarder Punch and voila! I kept it clean and simple inside the card. I hope I have inspired you to take the challenge! To see all the challenge details and to browse the gallery of submitted designs visit TGIF Challenges! 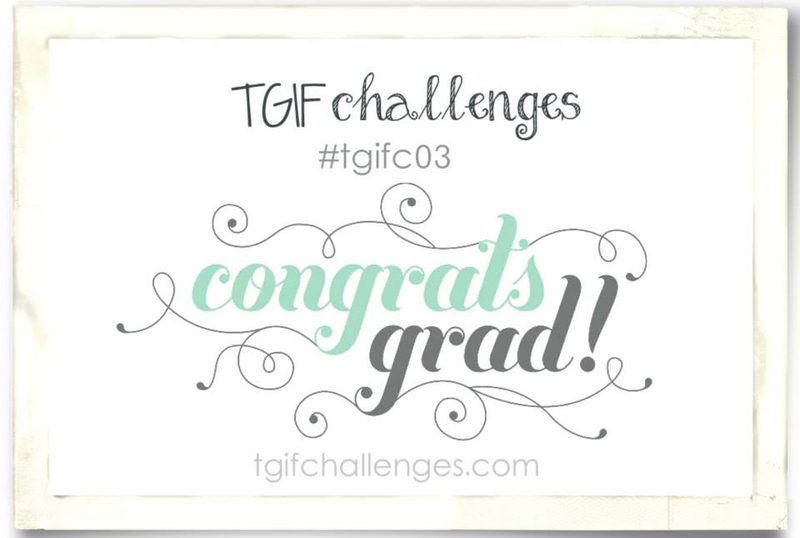 We are here every Friday sharing our designs and issuing the challenge to YOU! *note: the paper clip is from a past paper pumpkin kit and is not available for individual purchase. for more information about subscribing to the monthly paper pumpkin kit click here!